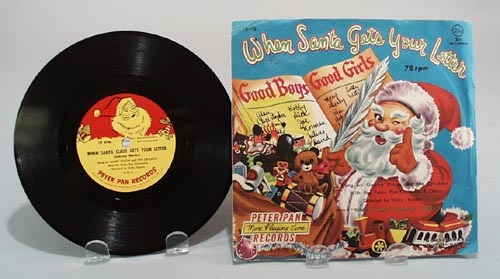 Peter Pan Christmas Record 1956 When Santa gets your letter 78rpm sung by Gabby Dixon and the Crickets with Peter Pan Orchestra & Chorus Directed by Vicky Kasen. X16 and on the other side Sing a Kris Kringle Jingle sung by Gabe Drake. The Record has a couple of scratches, but nothing major, and the jacket shows light wear, but I still consider this above average condition. 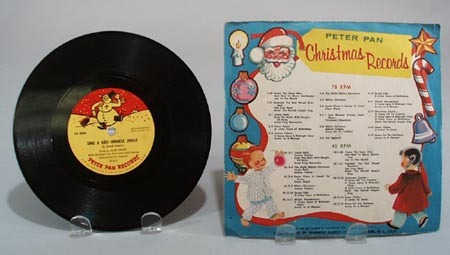 Record is 6 3/4"" and jacket is 7 1/4 x 7 1/2""
Items Similar To "Peter Pan Christmas Record 1956"